I’m taking a break from wedding posts to share a recipe that may come in handy this week. It requires a bit of work, but it’s so worth it. My husband said, “It tastes like Thanksgiving.” And so we will probably have it for the holiday… which leads me to the reason for this post. I know people are always worried about what to give vegans on Thanksgiving and vegans deserve to eat good, too! Also, this recipe takes a bit of time to prepare- so is good for special occasions. Additional note: I used medium to small sized veggies to make this. If you have large carrots, potatoes, celery stalks- just use one (or less) instead of two. Otherwise you’ll have too much filling. 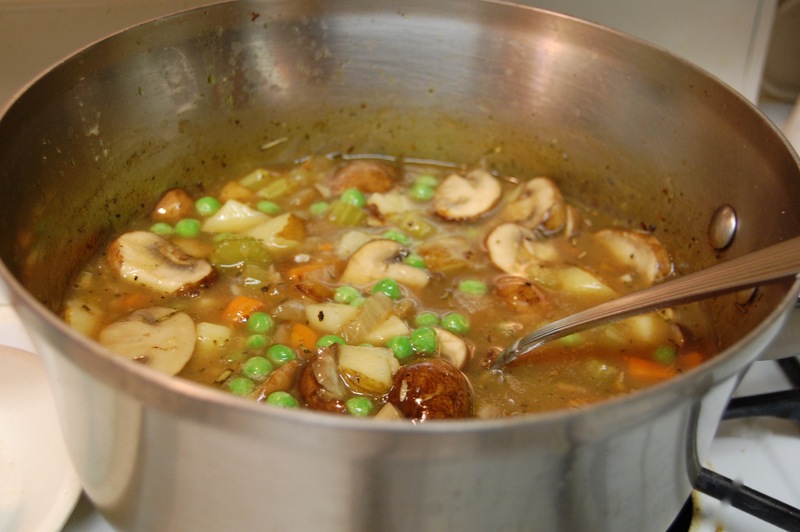 Pour the hot vegetable broth over the dried porcini mushrooms in your main large pot. Let steep for five minutes. Add the carrots, celery, and potatoes and bring to a boil with medium heat. Add a few tablespoons of temperate water to the flour, and stir to make a paste. Then add to the pot, stirring until dissolved. Turn down and simmer on low boil stirring occasionally. Saute the onions and garlic cloves in oil in a medium pan on medium heat for approximately ten minutes. Add the portobello and black pepper. Add the rosemary: I like to crush it with my fingers as I drop it into the pan. Stir frequently and continue sauteing until the onions are soft and transparent. Add the onion/mushroom mix to the vegetable stock pot. Add peas, corn and salt. Simmer for fifteen minutes or until the broth is thick. Now, I tend to just leave my original dried mushrooms in this mix because I find the texture interesting but if this bothers you, you can take them out and cut them up into small pieces before putting them back in, or just take them out and discard them. ingredients for Shepherd’s pie filling. Just need to add some corn! If you haven’t already boiled your potatoes for the topping, you might want to start the process now. Just cover them with water in a pot & let boil for fifteen minutes (I find it best to set a timer when I’m working on two parts of a recipe!) Then drain & set aside till needed. Measure out the water and add a few ice cubes to keep it really cold. Mix flour & salt in a medium sized bowl. Pour the oil (fresh from the freezer) in and use a fork to roughly blend. Do not blend too much; you want more of a crumbly mixture. Add a tablespoon of ice water and blend with fork. Continue adding the rest of the water by tablespoons and blending. Form a ball with the dough. If it doesn’t hold together add a bit more ice water. Knead the dough a few times. Place your ball on one of the pieces of wax paper. Put the other piece of wax paper on top and then use the rolling pin to roll it between the sheets of paper. Work quickly and don’t overdo it. You want the fats to stay solid and not melt until they make it into the oven. This is what produces a flaky pie crust! Make a 9″ circle, approximately 1″ bigger circumference than your pie pan. Carefully peel off the top piece of wax, flip the crust onto the pie pan and press inside. Now carefully peel off the remaining piece of wax. Good job. Now fill your pie crust with the filling. Cover with aluminum foil and bake for approximately 40 minutes. I put another cookie sheet underneath in case there is overflow. Take your large potatoes and mash them in a bowl with a fork. Add margarine, almond milk, garlic, and a pinch of salt and mix to a creamy consistency. Thanks. I hope they like it! I especially love it because it’s fairly healthy comfort food! 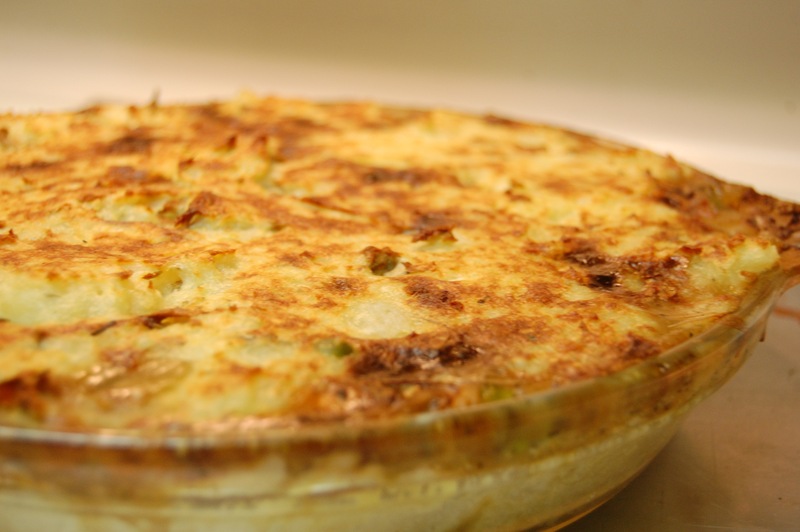 I don’t think I’ve seen crust on a shepherd’s pie before. Interesting twist! Yes, only added b/c I really wanted to try out a pie crust recipe- but we really liked it so it stuck!